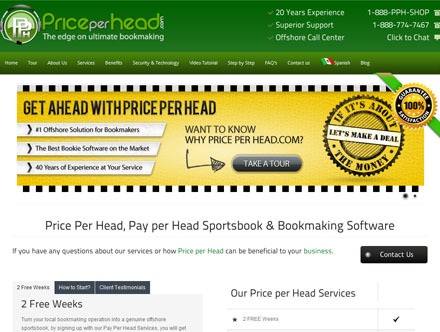 Priceperhead.com’s website states that they have 20 years of experience in the bookmaking business which is definitely something that every prospective bookie should look for when signing up with a new service. Longevity in the offshore gaming industry demonstrates that you have the ability to navigate the often choppy waters of managing a sportsbook. Their actual domain name, Price Per Head, was registered in 2004 which was when many companies stampeded into the PPH business. The representative we spoke to told us that they have actually been in business since the ‘70s! They are certainly making an effort to convince us that they have been writing sports bets for awhile. The true test of any company’s claims to longevity in the PPH business is how well they respond to their clients. It’s not hard to see how much experience they have after speaking to someone in charge. After getting passed around a few times we were put in touch with a new accounts manager that seemed pretty knowledgeable about the PPH business, but he was cagey. He actually refused to answer any of our questions until we gave him our name, phone number and email address. This is a bad idea unless you want to end up on a call list and be relentlessly telemarketed until the day you die and shouldn’t be a pre-requisite for just getting some basic information about their service. When we asked about the 2 weeks of free service he said it was only available if you qualify based on your package size but didn’t say how many players we needed. He told us their price per player per week is $25 for phone and $20 for internet players but then told us if they played in the casino it would cost us an additional $5 per week. He said if we signed up “today” we could take advantage of a 10% discount special. Although we acknowledge that Priceperhead is a professional looking company that uses top rated DGS gaming software for wagering and reporting; we couldn’t help but feel like we were being given the bait and switch routine. They start with a high price and immediately offer a discount with a limited time offer. They offer 2 weeks free but only if you qualify. We have found that many companies use teaser prices and rates on new clients to get them in the door; then turn around and jack up those prices once the football season starts and bookies are reluctant to move their players. Priceperhead.com comes off as a bit dishonest in their marketing tactics but can probably provide bookmakers with a reliable service as long as they don’t jack up their prices too much. They are also associated with bookoldschool.com.